Stories of Scripture are often portrayed two-dimensionally, making people in the Bible seem familiar, predictable, even flat. We don't always read their stories with much awareness of the pressures they faced, the doubts they had, the assumptions they made, or the alternatives they have chosen. The Dancing in the Desert Devotional Bible in the New Living Translation encourages readers to take an honest look at the people in the Bible. Chris Tiegreen, author of many popular devotionals for both men and women, has written 270 devotionals that explore the lives of people in the Bible and how they faced their own life's wilderness and found meaning, significance, and purpose with God. When we keep our gaze fixed on a story bigger than our own lives, we, too, can learn to dance in even the driest of our deserts. 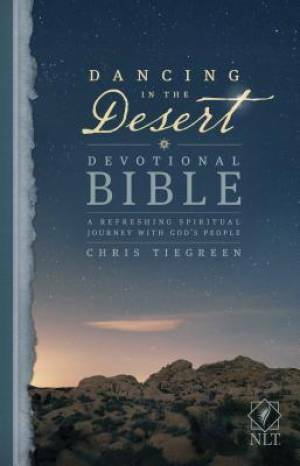 NLT Dancing in the Desert Devotional Bible by Chris Tiegreen was published by Tyndale House Publishers in November 2015 and is our 14832nd best seller. The ISBN for NLT Dancing in the Desert Devotional Bible is 9781414381565. Be the first to review NLT Dancing in the Desert Devotional Bible ! Got a question? No problem! Just click here to ask us about NLT Dancing in the Desert Devotional Bible .